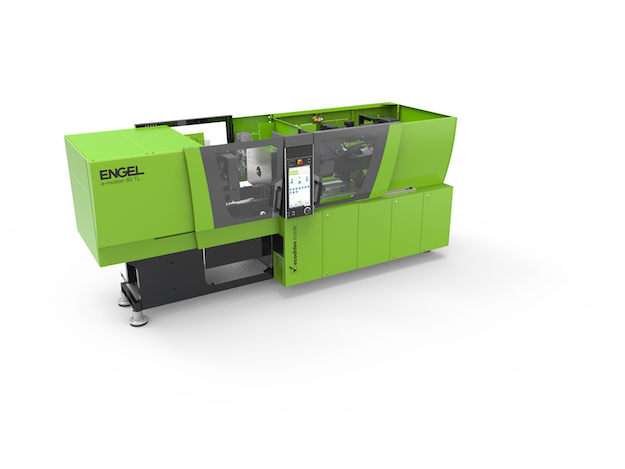 Engel North America (York, PA), part of the Engel Group headquartered in Schwertberg, Austria, will exhibit an e-motion 170/85 TL US in booth 1810 at PLAST-EX, part of the Advanced Design & Manufacturing (ADM) event on May 16 to 18, 2017, in Toronto. The machine will be utilizing an array of Engel’s iQ software products, which continually analyze critical process parameters in order to identify and immediately compensate for deviations before defective parts are made. Described as a self-regulating “smart” injection molding machine, the e-motion 170/85 TL US identifies minute deviations in production conditions and sets ideal production parameters, all while production operations continue. Engel’s iQ weight control keeps the injected melt volume and viscosity constant. The software adapts the switchover point and holding pressure profile to match the current conditions, automatically compensating for external influences. Its iQ clamp control determines mold breathing to continually adjust the clamping force. In-mold breathing—the reduction of clamp pressure when the melted material is being injected into the mold—can cause quality issues with the part, producing burn marks or flash, according to Engel. The clamp control software quickly determines the optimum clamping force and automatically keeps mold breathing within the ideal range, thus reducing rejects. The company’s e-flomo is an intelligent water manifold system that significantly improves part quality, process reliability and energy efficiency, according to Engel. The system controls flow rate, pressure, temperature and temperature difference to provide constant process conditions and improve reproducibility. Finally, iQ flow control optimizes temperature control processes based on the measurements provided by the e-flomo water distribution system. It independently regulates temperature differences and pump capacity, together with the temperature control unit, for each distribution circuit, thereby ensuring consistent conditions. Want to know what else is in store at PLAST-EX, part of Advanced Manufacturing Expo in Toronto this month? Then you should put “ Six reasons why you will want to be in Toronto in May ” on your reading list. Thanks to the tie-bar-less design of the machine, the system’s fully-integrated linear pick-and-place robot has full and easy access to the mold. The system will be running a single-cavity ENGEL inject 4.0 logo mold supplied by Haidlmair.